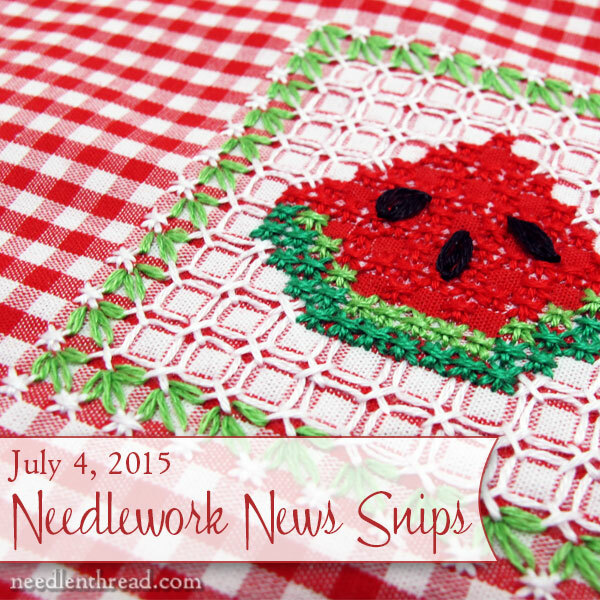 Needlework News Snips for July! Ummmm… I just love trick questions from five-year-olds. I knew from the outset the conversation would end badly. Yes, they do, I explained. July 4th is tomorrow’s date. In America, I explained further, Independence Day is on July 4th, and it’s our national holiday, which is why we celebrate with fireworks, picnics, and parties. Other countries have national holidays, too, I went on pedantically, but they aren’t necessarily on July 4th. But they still have the fourth of July, because it’s the date – just like today is July 3rd, tomorrow is July 4th. It’s just not necessarily a day they have fireworks and picnics. So…… she said, swatting a mosquito and totally missing the point of my lesson, they don’t have the Fourth of July? I grabbed a sparkler, lit it, handed it to her, and sent her off to frolic. Wherever you are, happy fourth of July! If you happen to be an American, Happy Independence Day! If you’re sweltering in the summer heat this weekend (or shivering with the cold, depending on your locale), take some time to enjoy this month’s needlework news snips! Sue, over at Tortoise Loft, published a tutorial for Woven Diamond Stitch, which can be used in counted work, but equally as well in surface embroidery. I like her colorful stitches sample! If you want some fun eye-candy, Rose Andreeva over at Roniy-Stitch posted a beautiful finish on a bead and embroidery piece. Nestled in needle painted flowers and foliage, you’ll find a fantastic lizard in bead embroidery. Definitely worth seeing! Thistle Threads recent post on the St. Martin Embroideries at the Met is worth checking out. If you like old ecclesiastical embroidery and old books, there’s a book out there on the St. Martin Embroideries, too – it’s out of print, but you can find it through used book sources. I wrote about the book (and figure embroidery) in this article. Teresa Wentzler is a popular cross stitch designer and she has a very informative blog that I enjoy reading. Recently, she’s been demonstrating her process for designing cross stitch pieces for eventual marketing. It makes good reading, and it will definitely give you a thorough appreciation for what goes into designing embroidery and cross stitch for the needlework market. For those who like to embroider foliage, over on BibliOdyssey, there’s a terrific collection of images of many, many strains of heather plants. Whoever knew there were so many varieties of heather? Many of those would make beautiful subjects for embroidery! Jennifer Alba’s new venture in embroidery – JHA Designs (located in New Hampshire) is selling embroidery kits now. Her designs are whimsical and “primitive” in style and they’d be heaps of fun to work. If that’s your design style and you’re looking for some unique kits, you can check out her offerings! Dina Kassel is an embroidery artist in California. Essentially, she’s a thread painter, and she has an incredible gallery of works. I especially enjoyed browsing through her Masters collection and her Kids Play collection. If you’ve ever wanted to embroider a VanGogh, or you’ve wondered what your favorite children’s book would look like, embroidered, you’ll find plenty of inspiration here! While anticipating some fantastic fireworks displays in the Kansas City area tonight, I’ll be hanging out with family today, doing summery things, like cutting up watermelon and making ice cream. No stitching in the forecast until Monday! Wherever you are, I hope you have a jolly weekend! March 21, 2015 Needlework News Snips! Hello Mary ! In France, our national Festive day is on July 14th and not in july 4th ! that will be fun for your niece ! Have a very good WE ! Thank you so much for the mention, Mary! I am a huge fan of your work and your site… thanks so much for all you do for stitchers and for advancing the Art of Needlework. A Happy 4th to you and yours! I love 5 year olds they ask really interesting questions. A Happy 4th of July to you and your family I hope you have a great day. I’m late today been to London on a City Walk with friends it was so hhhooottt but interesting. Thanks for all snip bits above and for sharing them with us my favourite is Rose Andreeva beaded embroidery lovely. Look forward to next weeks blogs have a great w/e, now back to Dorset Buttons will it never end so far I’ve made 48 and still making. Happy Independence Day, Mary, and many thanks for mentioning Tortoise Loft – The Blog. We may not have fireworks today, here in the UK, but you’ve certainly made my day! Happy 4th of July to you and your family too, Mary. Cute story! I am a huge fan of Teresa Wentzler and have tons of her charts and have done several of her pieces. Now I know where to find her again, thanks to you!! Here in Oz the main classical music radio stations paid tribute with a lot of US music, from Samuel Barber to John Adams and more. (I look forward to French music on 14 juillet.) I suspect you answered a 5-yo question from an adult perspective. What is important to an American 5-yo about the 4th of July? Fireworks! So – other countries have fireworks, but different countries have them on different days. Is there a pattern for the chicken scratch of the watermelon? It is too cute! Hi, Karen – I’ll be posting a link to that tutorial a little later this month – along with the project I used it on. Glad you like it! Happy Independence Day, Mrs. Corbet! Thanks for the positive review! I’ve started to get “fan mail” and it’s all because for your sweet words….. thanks for keeping hand embroidery alive and your appreciation of our art!